I was contacted by Cheryl Duncan last week asking if I could do a cookbook review, I immediately agreed. A few days later, I received the book and I am already in love with the cookbook. The book looks so appealing and enticing with all its amazing food pictures by Jack Turkel. "My Indian kitchen - Preparing delicious Indian meals without fear or fuss" by Hari Nayak is a perfect Indian cookbook for every cook - for novice to experts. It has simple recipes like the Sweet Mango Yogurt Lassi to exotic recipes like Samosas and Malabar Crab curry. The book also features recipes of Indian spice mixes to get you started on Indian cooking. 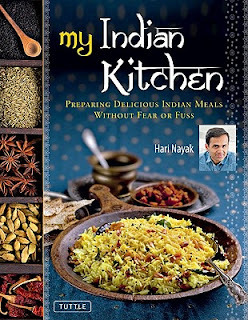 Hari Nayak is a celebrity Indian chef and a restaurateur from New Jersey. Growing up in a coastal rural town, Udipi in southwest India, Hari nayak shares his family's own style of southern Indian cooking that includes meats and seafood. The chef also includes the usual favorites such as his famous melt-in-your-mouth Cafe Spice Chicken Tikka Masala found at Whole Foods hot bars throughout the US. The book starts with an introduction to indian food which explains that Indian food is much more than just curry! Nayak also gives sample vegetarian and non-vegetarian party menus to get you started. he also gives suggestions on the various wines that pairs beautifully with Indian food. He then gives a few simple techniques and a very interesting introduction to exotic Indian ingredients. The book is then divided into various chapters - Indian spice mixes, chutneys and accompaniments, appetizers, soups and dals, vegetable and cheese dishes, fish and seafood, poultry and meat, bread and rice and finally desserts and drinks. A few of my favorite recipes from the book which I will be trying very soon.. Here is the first recipe I tried from the cookbook - Home Style Garam Masala. My entire smell is filled with the fragrance of the masala and I cant wait to use the masala in various recipes. Dry roast the whole spices in a small skillet, over medium heat, stirring until fragrant, 1 to 2 minutes. Remove the spices from the skillet and set aside to let cool completely. Grind the spices, with the bay leaves, in an electric spice grinder or mixer to a fine powder. Store in an air tight jar for up to 4 to 6 weeks. Nice garam masala. I too love the book. Amazing isn't it? Hi Divya, I enjoyed reading this review. I am definitely going to buy the book you've recommended because it looks like I'll enjoy using those recipes in my kitchen too. The masale scent is already filling my senses so I am leaving u this thank u note for making a Saturday morning so special and fragrant. Keep blogging. GM looks so aromatic!! I have got to get my hands on this book ASAP!!! The aroma of home-made masala takes you to a whole another world ! Nice one. will definitely try this one..
Home made garam masala always give nice flavour...Luks gr8! hi divya!! just came across your blog while looking for eggless pancake recipes. that page is not opening though. you should check out if there is some prob with it.btw loved your blog. i also liked your photography ver much. do check out my blog if you get time. Looks perfect and aromatic... Love it! Oh wow! Home made garam masala! I like the deep color and bet it smells great too, must try! Will check out in my library soon .. nice review. Good luck with the cook book review, interesting author to look forward to. Garam masala powder prep is really useful. Thanks for sharing it. just love home made masalas...this one sounds perfect..